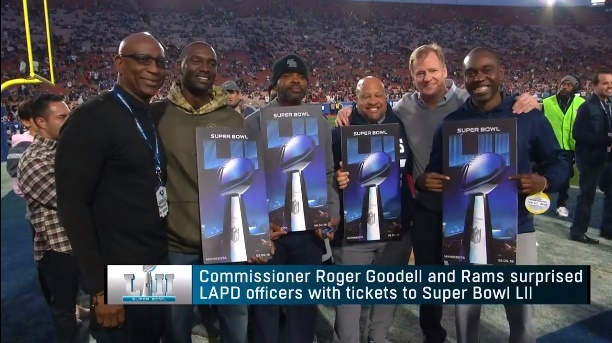 NFL Commissioner Roger Goodell and Hall of Fame running back Eric Dickerson presented four Los Angeles Police Department officers with tickets to the Super Bowl on Saturday to honor their commitment toward supporting underprivileged youth in Los Angeles, reports NFL.com. Officers Grant Goosby, James Holliman, Zarren Thompson, and Otis Swift were presented with the tickets during a ceremony before Saturday's NFC Wild Card Playoff Game between the Atlanta Falcons and Los Angeles Rams at the Los Angeles Memorial Coliseum. The four officers are founders and coaches for the Watts Bears -- a youth football program that serves children in South Central Los Angeles neighborhoods. Created by LAPD officers from the Southeast Division, the officers coach and mentor student-athletes in football and track and field. For their dedication to the community, Officers Goosby, Holliman, Thompson, and Swift will have an opportunity to attend Super Bowl LII in Minneapolis on Feb. 4.